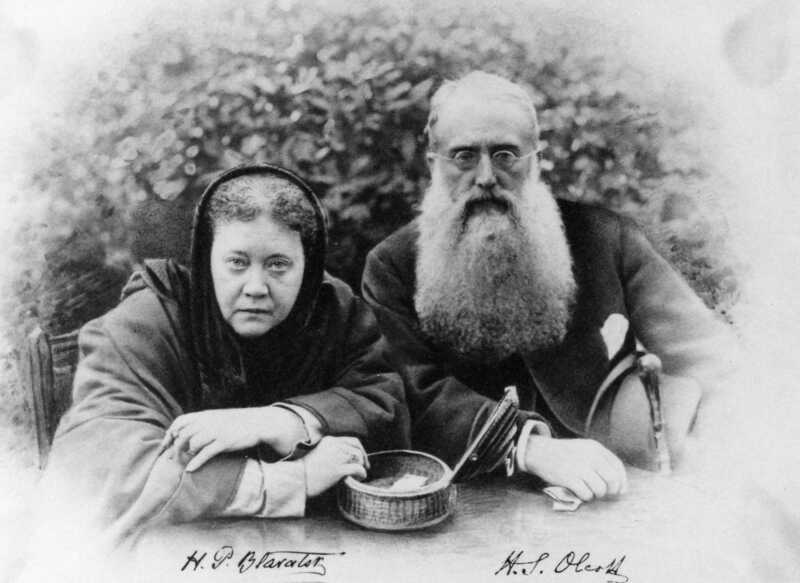 H. P. Blavatsky and Col. Olcott together in London, 1887. The Theosophical Movement was founded in New York in 1875 with three main founders – Helena Petrovna Blavatsky, Colonel Henry Steel Olcott, and William Quan Judge. From that moment and up until his death in 1907, Olcott remained the organisational leader and international president of the Society, which eventually moved its headquarters from the USA to Adyar in India. To answer such questions we have to present a number of important historical facts, most of which are entirely unknown to the majority of the members and supporters of The Theosophical Society – Adyar, who seem to labour under the very mistaken idea that HPB and Olcott continually worked closely and happily alongside each other, were always the best of friends, and that Olcott remained completely faithful to HPB, her teachings, and the Masters. These ideas are not true. Let us first see some of the things the Masters themselves had to say to and about Col. Olcott. “… we have no favourites, nor affections for persons, but only for their good acts and humanity as a whole. But we employ agents – the best available. Of these for the past thirty years the chief has been the personality known as H.P.B. to the world (but otherwise to us). Imperfect and very troublesome, no doubt, she proves to some, nevertheless, there is no likelihood of our finding a better one for years to come – and your theosophists should be made to understand it. … Theosophists should learn it. You will understand later the significance of this declaration so keep it in mind. Her fidelity to our work being constant, and her sufferings having come upon her thro’ it, neither I nor either of my Brother associates will desert or supplant her. As I once before remarked, ingratitude is not among our vices. “With yourself our relations are direct, and have been with the rare exceptions you know of, like the present, on the psychical plane, and so will continue thro’ force of circumstances. That they are so rare – is your own fault as I told you in my last. 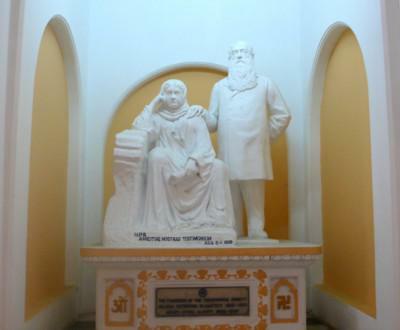 The famous statue of HPB and Col. Olcott at the international headquarters of the Adyar Theosophical Society, Adyar, Chennai, India. In time, Mr Judge became the vice-president of the entire Society, whilst also serving as the leader of the whole American section. His closeness and association of unshakeable trust with HPB – who wrote that he was “part of herself since several eons” and her “only friend” who she trusted “more than anyone in the world” – has been shown in the article Who was William Quan Judge? which should also be read with the shorter article The Welcome Influence of William Q. Judge. If the details and information presented in those two are not first understood, the reader will be unable to appreciate or comprehend this present article in its true light and significance. He wrote and published the following article in 1895, four years after HPB had passed away. H. S. Olcott versus H.P.B. 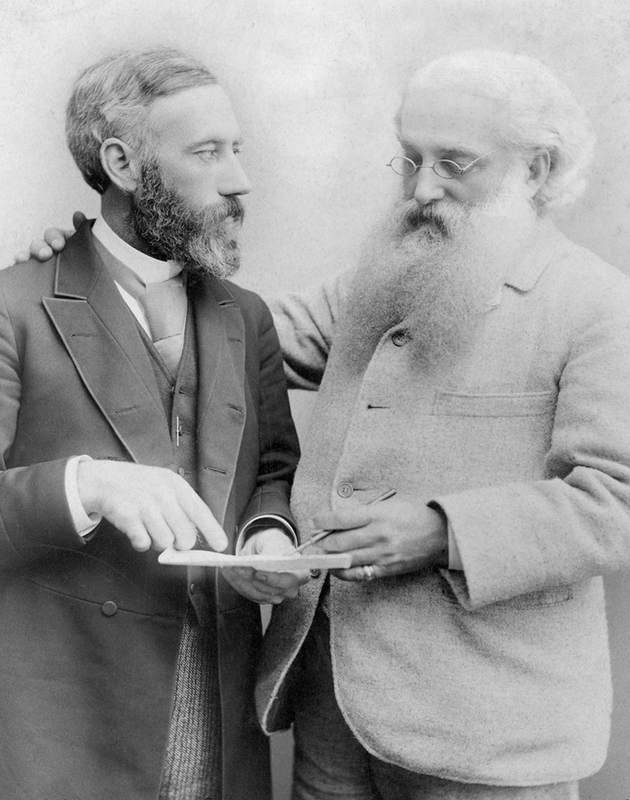 William Judge and Col. Olcott in happier times. Masters.” He wishes to defend those Masters, who sent H.P.B. as their messenger, by declaring that she “cooked up,” forged, and humbugged with, a long and important message to Brahmins at Allahabad in 1881. The Colonel is H.P.B.’s first Western disciple, ignorant to this day of practical occultism and not able to propound a question to the Masters; never heard of Masters except through H.P.B. He now preserves the honor of Masters by blackening the character of their messenger. Splendid defense, this, of the Masters! How does he explain the long silence of the Masters since 1881 on the subject? And another very pertinent question is this: How does this “defender of the Masters” explain his own silence in 1881 and since? He was present when the message was sent and knew of it. If he knew then that it was bogus why did he not divulge? If he did not know then, was it because he was unable to tell? If he has since been told by one of the Masters – a la Besant in the Judge case – will he kindly let us know which of the Masters told him, and when? All these questions ought to be answered, and many proofs given by him showing the least occult ability to decide on false or genuine messages, because he has attempted to classify H.P.B. with frauds, forgers and mediums. Hence the Masters who sent her are put by him in similar categories. Observe that the forgery now alleged by him was at the very time H.P.B. was giving out from the Masters the series of messages which have become known to all. If we believe him, then the delivery by this irresponsible medium of one false message must throw doubt on every message. Certainly Col. Olcott is no occultist whose decision we will accept. Each of us will be left to decide for this, that, or the other message according to fancy. Olcott does not like the one in question because he lives in India, and it is too gallingly true. Perhaps others may like it, and not be willing to accept other messages that contradict their partisan view of the London Lodge papers or metaphysics and science. For my part, the message in question testifies to its genuineness by its text, except for those who are hit by it, or those who have the Indian craze and think themselves Brahmins, or those whose self-interest and comfort are against it. If for a moment we accept this view of H.P.B. put forward by Olcott then there is, as she published herself, no certainty about any message. Who is to decide? If she hoodwinked with one message, all may be the same – bogus – and the great force and strength derived from a firm belief in Masters will be swept away, because she, their first messenger to us, is made out a fraud. All this is precisely what Olcott et al. wish to do. He cannot tolerate the idea that H.P.B. was greater than himself, so he throws around her memory the dirty cloak of tricky and irresponsible mediumship. That done, anything can be explained and anything accounted for. Well, for my part, I will not accept such nonsense, Col. Olcott being incompetent to decide on Mahatmic messages on occult lines, and being a disciple of H.P.B. is certainly much below her. His present utterance settles nothing about her character, about her mediumship or about the message; but it does serve to brand him as an ingrate and to place him plainly in view as one who calls that great teacher a fraud and a medium. MRS A. BESANT vs. H.P.B. Mrs Besant has sent an advance copy of an article to appear in Lucifer entitled “East and West.” It is a very long article devoted chiefly to William Q. Judge, but in it she takes up the message from the Master to the Allahabad Brahmins, which Col. Olcott deals with in his April Postscript. She says the message is not genuine, and thus walks beside Col. Olcott in abuse of H.P.B., for everyone with correct information knows that the message came through H.P.B. It may be asked why Besant and Olcott had become so strongly opposed to the particular Mahatma Letter from 1881 under discussion. This letter had been sent to a group of Brahmins, sectarian orthodox Hindus, who comprised the main membership of a branch of the Theosophical Society at Allahabad in India, a place which is also known as Prayag, hence this particular letter often being referred to by Theosophists as “the Prayag letter.” It was the only branch or lodge of the Theosophical Society in the whole world which had specifically refused to adopt or accept the first main objective of the Movement, i.e. to form a nucleus of Universal Brotherhood without distinction or discrimination of caste, race, religion, gender, and so forth. In 1893, two years after the death of HPB, Besant had met one of these Prayag Brahmins, namely G. N. Chakravarti, and was very soon entirely under his psychological and occult influence, eventually believing that he was a Master and Adept himself and trusting him implicitly. On a visit to India she was officially received into the fold of orthodox Hinduism and it was at his encouragement and injunction that she (a) lost much of her previous respect for HPB and began to criticise, belittle, and depreciate her, both privately and publicly, sometimes in the most awful of ways, (b) turned against William Q. Judge and began – alongside Col. Olcott, who had also fallen under Chakravarti’s influence – the destructive conspiracy against him and all of his students and followers who supported and revered HPB, finally resulting in the first split in the Theosophical Movement in 1895, (c) started presenting her own and contradictory version of “Theosophy” in the place of the original teachings, and (d) began the mass editing and alteration of HPB’s written works, including publishing the “Third and Revised Edition” of “The Secret Doctrine” which was found to contain approximately 40,000 alterations of various sorts from HPB’s original text and later the so-called “Third Volume” of “The Secret Doctrine,” the inclusion of certain material in it having involved her consciously and willingly breaking her Esoteric Section pledge of secrecy, a pledge which had been made on her “most solemn and sacred word of honour” and invoking the Higher Self, and which had been made on the understanding that it was binding for life and for lives. It was also during what could be called “the Chakravarti period” that Olcott published his volumes of “Old Diary Leaves,” which purport to be “The True History of the Theosophical Society” – and which are blindly accepted as such by Adyar Theosophists and even many misguided researchers and scholars – but which are nothing of the sort. Those who wish to know the real facts about the history and background of the Theosophical Movement are invited to read these three important books. 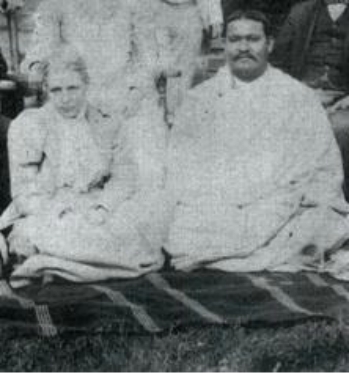 Annie Besant with G. N. Chakravarti. This was also published by Mr Judge in his article “A Mahatma’s Message To Some Brahmans,” to be found in “William Q. Judge Theosophical Articles” Vol. 2. As can be seen from this and the Masters’ other letters, they are direct and straight to the point, whilst being sufficiently stern and forceful in their tones when necessary. They have no interest in pandering to people’s religious, social, or personal prejudices and preferences but simply say the truth as it is. Col. Olcott at his desk with framed photo of HPB. and sent him away, saying that she had come to realise that he had a dark influence. She then adopted C. W. Leadbeater as her guide and confidant, which was even worse! After having presided over the proceedings in London in 1906 which resulted in Leadbeater being forced out of the Theosophical Society after allegations and confessions of sexual misconduct against young boys, Olcott’s last great mistake in that incarnation was to succumb to Besant’s pressures the following year to have Leadbeater re-admitted and raised to a place of prominence. He died believing that Leadbeater was a chosen agent of the Masters. In closing, despite his many serious mistakes and faults, Col. Olcott achieved much for the Cause of Theosophy, particularly in the earlier part of his Theosophical career, and also deserves our lasting gratitude and appreciation for his tremendous contribution to the revival of Buddhism and Buddhist philosophy in Asia and elsewhere. But when it comes to the living Theosophical Movement itself, the fact is that this sincere but eventually very misguided man disqualified himself through his own actions from the great respect and reverence in which he would otherwise have been held by all Theosophists everywhere. For information about BOOKS ON THEOSOPHY please click HERE.